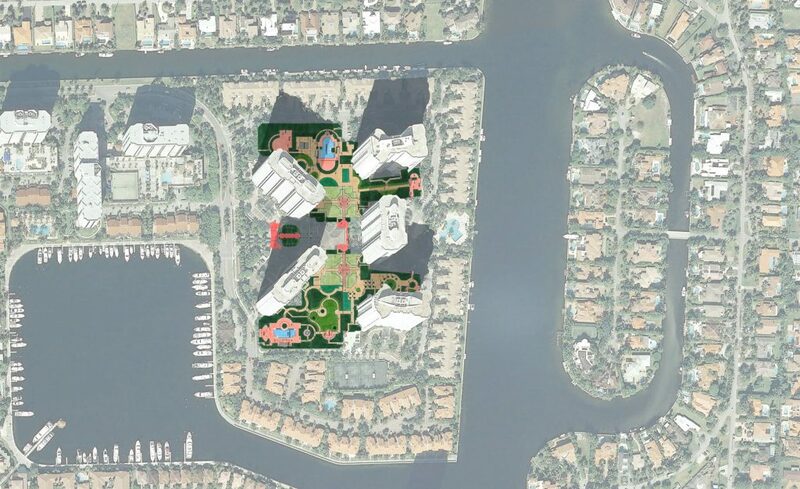 36-acre waterfront development with incredible ocean and Intracoastal views. This community features courtyard homes and five 30-story towers for a total of 1,100 luxury residences. At the center of the community is a 25,000 sq. ft. full service residents club & spa facilities and lanai deck with pools, spas, outdoor dinning areas and lush tropical planting. Provided renovation planning and landscape architecture services for the lanai deck and residents club & spa. The extensive 7-acre lanai deck was built on top of the structured parking connecting the five towers and was suffering from widespread leaking. LDW reconfigured the leaking planters, redesigned the overall planting and provided lighting plans for the lanai deck as well as the residents club & spa.